Leading Manufacturer of mini lift, 300 kg mini lift, electric mini lift, 300kg lifting mini lift, motor type mini lift and mini lifting machine from Coimbatore. 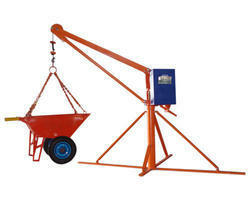 We are remarkable entity, engaged in offering high quality 500 Kg Mini Lift that is used for lifting different items. The offered winch is manufactured by our adroit professional from superior quality component and modern technology in line with industry quality norms. In order to maintain quality, this winch is sternly tested on different parameters. Our provided winch can be designed in various sizes and designs as per the needs of the clients. We are leading manufacturers and suppliers of 500 Kg Mini Lift in Coimbatore, Chennai, Cuddalore, Coimbatore, Dharmapuri, Dindigul, Erode, Kanchipuram, Kaniyakumari, Karur, Madurai, Nagapattinam, Namakkal, Nilgiri, Perambalur, Ariyalur, Pudukottai, Ramanathapuram, Salem, Sivagangai, Teni, Thanjavur, Thiruvarur, Thiruchirapalli, Trichy, Tirunelveli, Tiruvallur, Tiruvannamalai, Tuticorin, Vellore, virudhunagar, Viluppuram, Tamilnadu. and all southern Regions(Karnataka, Kerala, Andhra Pradesh, Puducherry)Our offered grease dispenser is customized with anti lock pressure plates that help in ensuring the easy flow of grease. This grease dispenser is developed using superior quality material & latest techniques. Also, offered grease dispenser is checked by our quality analysts in order to find out any defect. 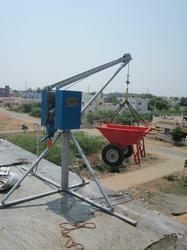 We are remarkable entity, engaged in offering high quality 300 Kg Mini Lift that is used for lifting different items. The offered winch is manufactured by our adroit professional from superior quality component and modern technology in line with industry quality norms. In order to maintain quality, this winch is sternly tested on different parameters. Our provided winch can be designed in various sizes and designs as per the needs of the clients. We are leading manufacturers and suppliers of 300 Kg Mini Lift in Coimbatore, Chennai, Cuddalore, Coimbatore, Dharmapuri, Dindigul, Erode, Kanchipuram, Kaniyakumari, Karur, Madurai, Nagapattinam, Namakkal, Nilgiri, Perambalur, Ariyalur, Pudukottai, Ramanathapuram, Salem, Sivagangai, Teni, Thanjavur, Thiruvarur, Thiruchirapalli, Trichy, Tirunelveli, Tiruvallur, Tiruvannamalai, Tuticorin, Vellore, virudhunagar, Viluppuram, Tamilnadu. and all southern Regions(Karnataka, Kerala, Andhra Pradesh, Puducherry)Our offered grease dispenser is customized with anti lock pressure plates that help in ensuring the easy flow of grease. This grease dispenser is developed using superior quality material & latest techniques. Also, offered grease dispenser is checked by our quality analysts in order to find out any defect. We are remarkable entity, engaged in offering high quality Electric Mini Lift that is used for lifting different items. The offered winch is manufactured by our adroit professional from superior quality component and modern technology in line with industry quality norms. In order to maintain quality, this winch is sternly tested on different parameters. Our provided winch can be designed in various sizes and designs as per the needs of the clients. We are leading manufacturers and suppliers of Electric Mini Lift in Coimbatore, Chennai, Cuddalore, Coimbatore, Dharmapuri, Dindigul, Erode, Kanchipuram, Kaniyakumari, Karur, Madurai, Nagapattinam, Namakkal, Nilgiri, Perambalur, Ariyalur, Pudukottai, Ramanathapuram, Salem, Sivagangai, Teni, Thanjavur, Thiruvarur, Thiruchirapalli, Trichy, Tirunelveli, Tiruvallur, Tiruvannamalai, Tuticorin, Vellore, virudhunagar, Viluppuram, Tamilnadu. and all southern Regions(Karnataka, Kerala, Andhra Pradesh, Puducherry)Our offered grease dispenser is customized with anti lock pressure plates that help in ensuring the easy flow of grease. This grease dispenser is developed using superior quality material & latest techniques. Also, offered grease dispenser is checked by our quality analysts in order to find out any defect. 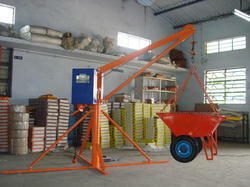 We are instrumental in offering finest quality Material Handling Lift to our valuable clients. Our provided lift is manufactured using optimum quality components and innovative technology in sync with industry norms. The provided lift is tested against different quality measures so as to ensure its quality. Apart from this, we offer this lift in different sizes and specifications for our customers to choose from. We are remarkable entity, engaged in offering high quality Motor Type Mini Lift that is used for lifting different items. The offered winch is manufactured by our adroit professional from superior quality component and modern technology in line with industry quality norms. In order to maintain quality, this winch is sternly tested on different parameters. Our provided winch can be designed in various sizes and designs as per the needs of the clients. We are leading manufacturers and suppliers of Motor Type Mini Lift in Coimbatore, Chennai, Cuddalore, Coimbatore, Dharmapuri, Dindigul, Erode, Kanchipuram, Kaniyakumari, Karur, Madurai, Nagapattinam, Namakkal, Nilgiri, Perambalur, Ariyalur, Pudukottai, Ramanathapuram, Salem, Sivagangai, Teni, Thanjavur, Thiruvarur, Thiruchirapalli, Trichy, Tirunelveli, Tiruvallur, Tiruvannamalai, Tuticorin, Vellore, virudhunagar, Viluppuram, Tamilnadu. and all southern Regions(Karnataka, Kerala, Andhra Pradesh, Puducherry)Our offered grease dispenser is customized with anti lock pressure plates that help in ensuring the easy flow of grease. This grease dispenser is developed using superior quality material & latest techniques. Also, offered grease dispenser is checked by our quality analysts in order to find out any defect. We are remarkable entity, engaged in offering high quality Mini Lifting Machine that is used for lifting different items. The offered winch is manufactured by our adroit professional from superior quality component and modern technology in line with industry quality norms. In order to maintain quality, this winch is sternly tested on different parameters. Our provided winch can be designed in various sizes and designs as per the needs of the clients. We are leading manufacturers and suppliers of Mini Lifting Machine in Coimbatore, Chennai, Cuddalore, Coimbatore, Dharmapuri, Dindigul, Erode, Kanchipuram, Kaniyakumari, Karur, Madurai, Nagapattinam, Namakkal, Nilgiri, Perambalur, Ariyalur, Pudukottai, Ramanathapuram, Salem, Sivagangai, Teni, Thanjavur, Thiruvarur, Thiruchirapalli, Trichy, Tirunelveli, Tiruvallur, Tiruvannamalai, Tuticorin, Vellore, virudhunagar, Viluppuram, Tamilnadu. and all southern Regions(Karnataka, Kerala, Andhra Pradesh, Puducherry)Our offered grease dispenser is customized with anti lock pressure plates that help in ensuring the easy flow of grease. This grease dispenser is developed using superior quality material & latest techniques. Also, offered grease dispenser is checked by our quality analysts in order to find out any defect. 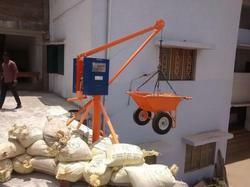 We are remarkable entity, engaged in offering high quality 200 Kg Mini Lift that is used for lifting different items. The offered winch is manufactured by our adroit professional from superior quality component and modern technology in line with industry quality norms. In order to maintain quality, this winch is sternly tested on different parameters. Our provided winch can be designed in various sizes and designs as per the needs of the clients. We are remarkable entity, engaged in offering high quality Rop Lift that is used for lifting different items. The offered winch is manufactured by our adroit professional from superior quality component and modern technology in line with industry quality norms. In order to maintain quality, this winch is sternly tested on different parameters. Our provided winch can be designed in various sizes and designs as per the needs of the clients. We are leading manufacturers and suppliers of Rop Lift in Coimbatore, Chennai, Cuddalore, Coimbatore, Dharmapuri, Dindigul, Erode, Kanchipuram, Kaniyakumari, Karur, Madurai, Nagapattinam, Namakkal, Nilgiri, Perambalur, Ariyalur, Pudukottai, Ramanathapuram, Salem, Sivagangai, Teni, Thanjavur, Thiruvarur, Thiruchirapalli, Trichy, Tirunelveli, Tiruvallur, Tiruvannamalai, Tuticorin, Vellore, virudhunagar, Viluppuram, Tamilnadu. and all southern Regions(Karnataka, Kerala, Andhra Pradesh, Puducherry)Our offered grease dispenser is customized with anti lock pressure plates that help in ensuring the easy flow of grease. This grease dispenser is developed using superior quality material & latest techniques. Also, offered grease dispenser is checked by our quality analysts in order to find out any defect.